Among the awardees at Bendix’s Knorr Production System (KPS) awards was Mark Wasem, Bendix director of business excellence, who earned a Lifetime Achievement Award. He is shown with Carlos Hungria (left), Bendix chief operating officer, and Michael J. Hawthorne (right), Bendix president and CEO. ELYRIA, Ohio — Bendix recently recognized 10 of its employees and one group at its sixth annual Knorr Production System (KPS) Awards in Bowling Green, Kentucky. 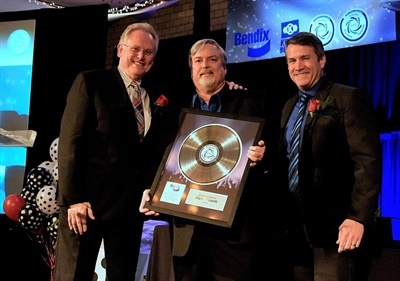 The safety solutions and air brake systems supplier said the KPS award recognizes teams and individuals who are helping to improve workplace safety, production quality, and manufacturing efficiency. This year's recipients, who were honored for their 2018 achievements, represented Bendix facilities in Acuña, Mexico; Bowling Green, Kentucky; Elyria, Ohio; Huntington, Indiana; and North Aurora, Illinois. This year’s KPS award categories included Safety STARS (Safety Top Achievement Recognition System), Environmental, Best Quick Kaizen, Most Quick Kaizen, KPS Outstanding Contributors, and the Lifetime Achievement Award. • Safety STARS: Acuña, Mexico, Maintenance, Plant 3 — Julio Domínguez, Fernando Escareño, Eduardo Gómez, Kevin Gómez, Roberto Guillen, Eduardo Hernández, Rene Hernández, Destine Herrera, Daniel Olvera, Simón Ramírez, Alberto Reyes, Natanael Reyes, Juan Robles, and Luis Valenzuela. • Environmental: Saidi Zorrilla, Acuña, Mexico. • Best Quick Kaizen: Fernando Escareño, Acuña, Mexico; Justin Reynolds, Bowling Green, Kentucky; Olga Vivero, North Aurora, Illinois. • Most Quick Kaizen: Karla Valadez, Acuña, Mexico. • KPS Outstanding Contributors: Maria Gutierrez, Elyria, Ohio; Juan Carlos Hernandez, Acuña, Mexico; Tricia Miller, Huntington, Indiana; and Chris Ne, Huntington, Indiana. • Lifetime Achievement Award: Mark Wasem, Bendix director of business excellence, Elyria, Ohio. All Bendix manufacturing operations are committed to the KPS quality, productivity, and improvement culture, practiced throughout the Munich, Germany-based Knorr-Bremse Group, of which Bendix is a member, according to the company.